St. Petersburg, located on the Neva River and the Baltic Sea, is Russia’s storied city of riches and romance. This afternoon, arrive in St. Petersburg by air or high-speed train. Your driver will meet you upon arrival for your transfer by private car to the city center. Comfortable and elegant, your five-star hotel occupies an unrivaled setting in St. Isaac’s Square at the hub of St Petersburg’s vibrant city center. St. Isaac’s Cathedral stands opposite the hotel, and the renowned Hermitage Museum is only a short walk away. This evening, we recommend dinner at your hotel. Russian in every sense, the restaurant offers exciting flavors from home and abroad served in the company of fine wines. Don’t miss the exquisite selection of chilled vodkas and the best Russian caviar. Begin your day with breakfast at your hotel, followed by a full-day city tour. This morning, become acquainted with one of the most beautiful cities in the world. Founded in 1703, among its many poetic names are “Northern Venice” and “Northern Palmyra”. St. Petersburg is defined by a dramatic history, fascinating palaces and cathedrals, beautiful bridges over Venetian-like canals, and spacious squares and wide streets decorated with edifices in baroque and classical styles. Passion for the city is infectious. 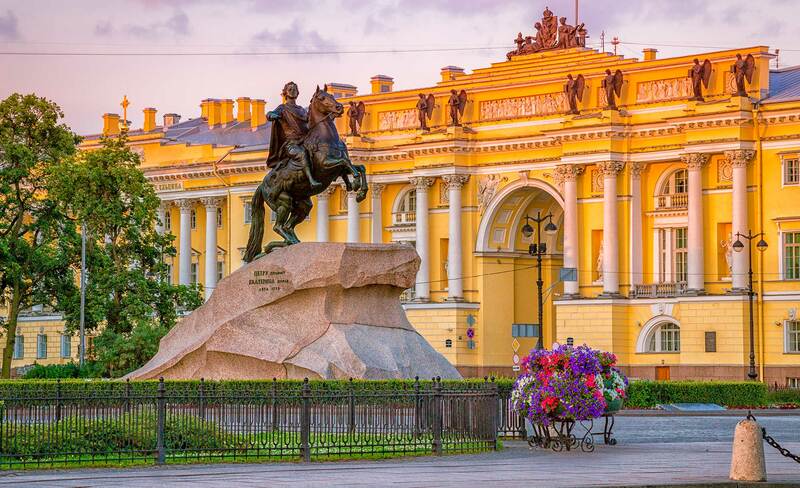 In 1991 St. Petersburg was declared a UNESCO World Heritage Site. With numerous palaces and the world famous Hermitage on the banks of the Neva River, the city is Russia’s most popular destination, drawing visitors from all over the world in all seasons. Visit Peter and Paul’s fortress. Standing on a small island at the centre of the Neva delta, the fortress was founded by Peter the Great and is the oldest building in the city. Until 1917, the fortress was mainly used for holding political prisoners, including Dostoyevsky, Lenin’s brother, Alexander, and Peter the Great’s own son, Alexei. At the heart of the fortress is the Cathedral of St. Peter and St. Paul, with its landmark gold spire, where nearly all of Russia’s pre-Revolutionary leaders were buried. In the afternoon enjoy the charm of 19th-cenutry Russia in one of the most interesting and best preserved palaces of the city. Yusupov Palace, built in the 1740s was bought by Catherine II for one of her ladies in waiting. The following century, the palace was purchased by Prince Nikolai Yusupov, a wealthy Russian senator, government minister and influential patron of the arts. It was here, several generations later, that Prince Felix Yusupov planned and carried out the murder of Rasputin, who was lured to the palace under the pretext of meeting Felix’ young wife, Irina. All the rooms are beautifully restored, exhibiting many fine works of art. The highlight is the exquisite private theatre, built for Zineida Yusupov, where such renowned artists as Anna Pavlova and Feodor Chaliapin performed at the height of their careers. For a casual dinner this evening, we suggest traditional Eastern European pies (pirozhki) both savory and sweet. 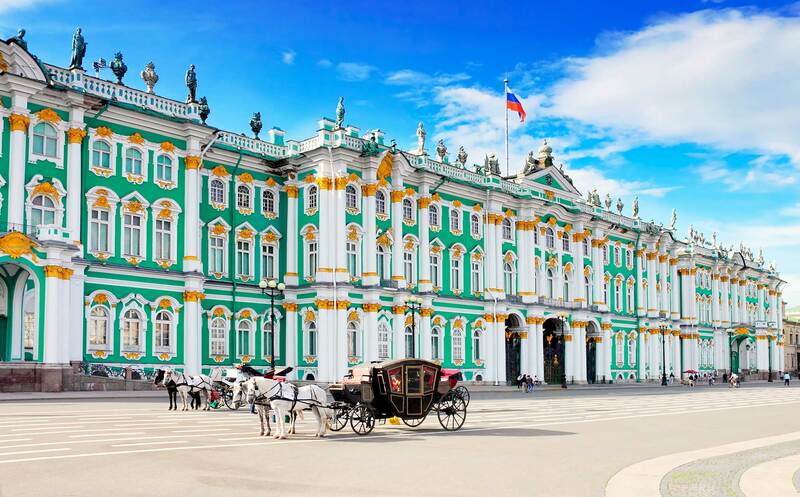 Enjoy breakfast at your hotel this morning, followed by a privately guided visit to the State Hermitage Museum. The Hermitage is the largest museum in the world, and it attracts some 3 million visitors per year. The total current collection, exhibited in 350 halls, includes more than three million works of art and artifacts. Among them are paintings, graphic works, sculptures, works of applied art, archaeological finds and world coins and currency. Beloved by all are the works of da Vinci, Raphael, Rembrandt, an impressive collection of impressionists, and the largest collection of Titians in existence. The main building of the Hermitage Museum, located on the bank of the river Neva, is the Winter Palace. It was built between 1754 and 1762 and was once the main residence of the Russian tsars. The museum was founded in 1764 when Catherine the Great purchased a collection of 255 paintings from Berlin. Spend the morning focusing on your area of interest. Your afternoon is at leisure. You may wish to stroll along the Moika River, which encircles central St. Petersburg and is crossed by 15 bridges, each with historical and artistic significance. During the summer season you have the option of boarding a public canal boat ride. For dinner tonight, we recommend the city’s best steakhouse, where rich leather upholstery, green bankers’ lamps, and the sepia pictures from a bygone era complement the delicious food. Alternatively, dine at a trendy Russian restaurant in the city center, offering traditional dishes from the Russian tsars’ cuisine during the 19th and 20th centuries. This morning, join your guide for a visit to the sumptuous Tsar Village (Tsarskoye Selo) – summer residence of Russian Emperors. Located in the town of Pushkin, approximately 15 miles from the center of St. Petersburg, the Tsar Village is comprised of several pavilions, beautiful lakes and gardens and the wonderful Catherine Palace. The summer palace was originally given by Peter the Great to his wife Catherine, and was rebuilt at the behest of their daughter, Empress Elizabeth, by Italian architect Francesco Bartolomeo Rastrelli in 1756. The palace is a huge, elegant building with white Baroque moldings set against a blue background, in a lovely park with elaborate gardens, canals and pavilions. The interior is no less striking. Some of the more sumptuous rooms include the Great Hall, the State Dining Room, the Amber Room, the Blue Drawing Room, the bedroom of Alexander I’s wife Elisabeth and the Palace Church. Return to the city this afternoon, where the remainder of the day is yours to explore on your own. You may wish to visit Peterhof, with its Grand Palace and parks, The Museum of Siege or the Russian Museum. This evening, visit the Mariinsky Theatre, where Russia’s ballet and opera stars have shined for more than two centuries. If there is a performance this evening, you have the option of reserving tickets in advance. For dinner we suggest Russian cuisine across from the theater. This morning, meet your driver and transfer to the airport by private car in time for your departure flight, or connection to your next Willing Foot destination.